I had the opportunity to catch up with three of three of my favorite people in the industry. Not only are they incredibly knowledgeable, but have a solid pulse on the Mold Making industry. 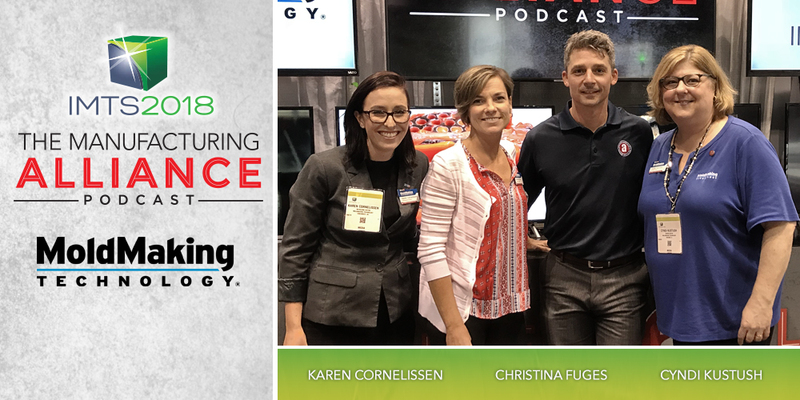 Christina Fuges; Editorial Director for MoldMaking Technology Magazine, Cyndi Kustush; Senior Editor at MoldMaking Technology Magazine, Karen Cornelissen; Managing Editor at MoldMaking Technology Magazine. My name is Cody Deadman. I am reaching out from CAMplete Solutions. I have listened to your podcast for quite some time now and when I saw you guys filming at IMTS I had to share it on our social media pages. Your podcast is truly an invaluable resource within the industry and I, along with the others here appreciate it . I wanted to reach out as I know others here have expressed interest in the possibility of being a guest on the show. Not sure if that is something you are looking for, but if you are ever interested in discussing post processors, simulation or 5-axis machining, we would love to have our Vice President come on and discuss the topic. On top of being the software experts when it comes to 5-axis machining, we also run a shop downstairs (Miltera) that does some pretty crazy work. You can the shop in this video from John Saunders (NYCCNC) on his youtube page. If this is something you would ever be interested in shoot me and email. And if not, we still appreciate the podcast and the time you put into helping the industry.